All Rush items listed below are authentic and very limited. We do not carry multiple items. All prices and availability are subject to change. All prices include shipping and handling for all USA customers. All other destinations will require actual shipping cost to complete transaction. Have a question? Ask us before purchasing the item. Thank You. 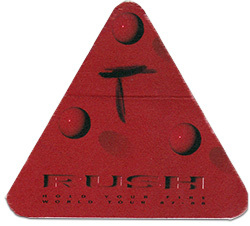 Description: 1987 - 1988 Rush Hold Your Fire Tour Backstage Pass. Item in VG+ condition. 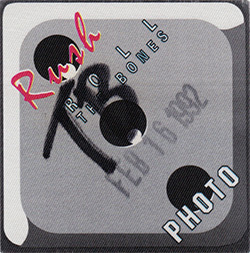 Description: 1992 Rush Roll The Bones Tour Photo Pass. Item in VG+ condition. 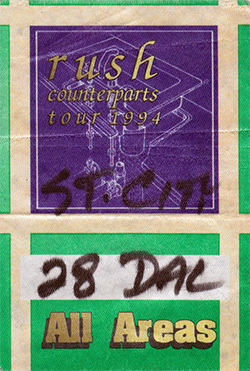 Description: 1994 Rush Counterparts Tour All Areas Pass. 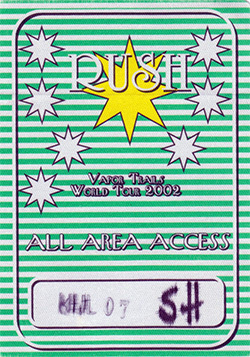 Pass is peeled with paper backing. Description: 2002 Vapor Trails Tour All Area Access Pass. Pass is peeled with paper backing. 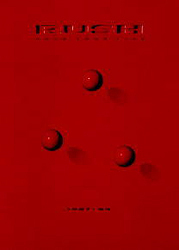 Description: Rush 1986 Power Windows Tour Book. 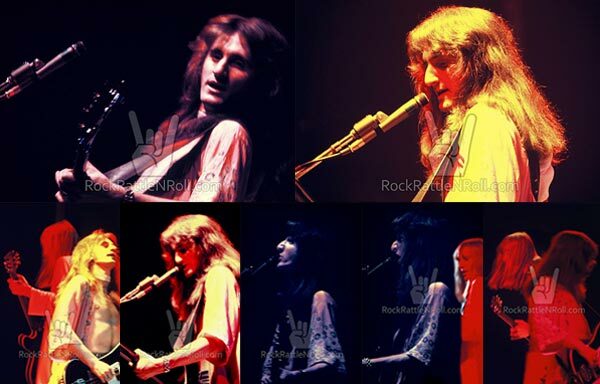 Description: Rush 1988 Hold Your Fire Tour Book. 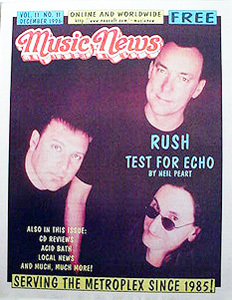 Description: 1995 Music News Magazine featuring Rush. 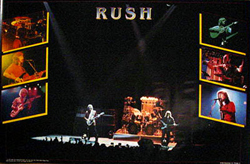 Description: Rush 1982 Retail Poster. LAST ONE! Size 21x29. Item in VG- condition. This poster has many flaws, tears, rips, pin-holes, creases. Please be advised item Sold As Is. The poster shown here is NOT the poster you are buying.